There are those rare items that have great appeal among the general populations: Picasso’s paintings and signatures of the famous throughout history, to name a couple. But for some collectors, the items they seek are considered rare because of errors in their production, which give them unique value in the marketplace. In this article, we’ll take a look at the curious cases of mistakes that became collectibles. In one of the most famous cases of a coin becoming a collectible because of a mistake, the double die Lincoln one cent was created in 1955. This mistake was produced when dies from a master die were misaligned in forming the pennies. This led to the impression that numbers and letters on the coin were slightly doubled. Over 40,000 of the double Lincoln pennies were produced, before the mint employees noticed and stopped production. Now, an individual coin could be worth thousands of dollars to collectors. NBA Elite 11 was supposed to be a showpiece product at the end of 2010 for EA Sports. But glitches in the game and production issues meant the product was never released to the general public. The problem for EA Sports was that they had already begun promotion for the product and released several copies to the media. The few copies of NBA Elite 11 available are now worth considerably more than any other newer games released in 2016. A mistake in publishing has rarely made so much money for collectors. In 1631, publishers Robert Barker and Martin Lucas attempted to print their own version of the bible. They only realized they’d made a small typographical error after their book went to print. The error left out the word “not” in “Thou shalt not commit adultery.” Only 11 copies of the so called “Wicked Bible” remain in modern day, and one copy has recently been offered for sale at $99,500. It can sometimes only take a small twist of fate and circumstance to turn a seemingly ordinary item into a rare collectible worth thousands of dollars! If you’d like to learn more about the value of items in your home, speak with our collectibles experts today. 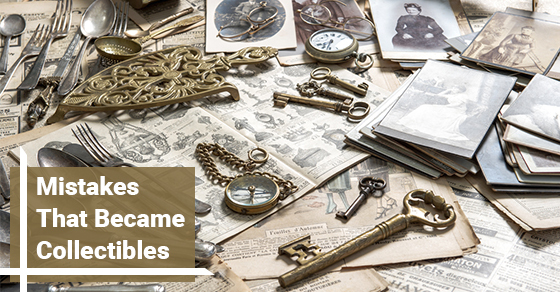 We can help you achieve full value for those rare items from the past.